Identify the components of the universe: black holes, galaxies, nebulae, solar systems, stars, planets, meteors, comets, and asteroids. Amazing Space is a set of web-based activities primarily designed for classroom use, but made available for all to enjoy. An animation of a comet's passage through the solar system - Compared to the planets, most comets have highly elliptical orbits and widely varying orbital speeds. Comet Halley's next passage through the inner solar system will occur in the year 2061. Atlas of the Universe - This web page is designed to give everyone an idea of what our universe actually looks like. There are nine main maps on this web page, each one approximately ten times the scale of the previous one. The Cosmic Distance Scale - This feature will give an impression of how immense our Universe is by employing a method used many times in "Power of 10" films - that is, starting with an image of the Earth and then zooming out to the furthest visible reaches of our Universe. Spiral Galaxy pictures - Alwyn Botha has posted this excellent set of galaxy pictures to assist those who want to take their own astrophotographs, or those who simply want to see the beautiful pinwheel shapes of spiral galaxies. Thanks for all of the hard work Alwyn. Hubble Space Telescope's greatest hits - some of the best images from 1990-1995, plus links to other Hubble images. National Science Foundation Division of Astronomical Sciences provides some useful links to astronomical on-line resources. Star Journey is based on National Geographic's popular map, "The Heavens." Compare explanations for the origin of the universe: Big Bang, nucleosynthesis, galaxy, and star formation. Construct a solar system model that illustrates ratios and proportions of distance and size of planets. Build a Solar System - Make a scale model of the Solar System and learn the real definition of "space." Explain the evolution of a star through stages of its development. Classify galaxies according to shape. Explore the role of astronomical events in the earth�s history: asteroid/meteor impacts, solar flares, and comets. Compare and contrast the earth with other planets in the solar system. 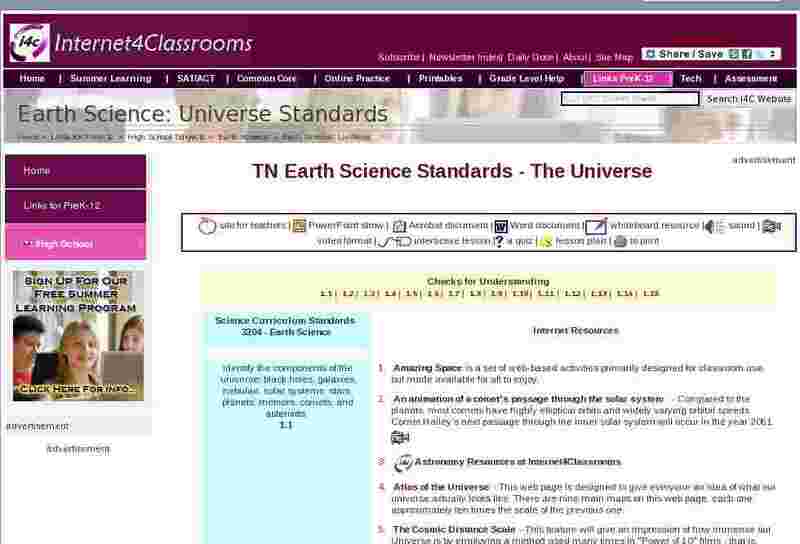 Exploring Planets in the Classroom - Hands-on Activities for Science Classes. More than 25 hands-on science activities are provided in classroom-ready pages for both teachers and students for exploring Earth, the planets, geology, and space sciences. Mars Global Surveyor Mars Orbiter Camera Image Gallery - Mars Orbiter Camera (MOC) Image Gallery! This site contains the pictures of Mars acquired by NASA's Mars Global Surveyor (MGS) orbiter through 31 January 2001. MOC is operated daily at Malin Space Science Systems. The company is responsible for archiving the camera data once they are received on Earth. MSSS Viking Image Archive - This page provides access to a large fraction of the set of images taken by the Viking orbiters from 1976 to 1980. Solar System - This real-time 3D simulation allows the student to inspect our solar system from any angle or vantage point as well as gain detailed information about each element. Solar System Live - Where are the planets right now. Go to this site to find. You can also reset the date for times in the past or future to see where the plants were, or will be. A view of the Inner planets is also available. Solar System Scale Model Page - Making scale models of the solar system is a useful way to learn about it. This page lists various related pages. Views of the Solar System - This site presents a vivid multimedia adventure unfolding the splendor of the Sun, planets, moons, comets, asteroids, and more. Discover the latest scientific information, or study the history of space exploration, rocketry, early astronauts, space missions, spacecraft through a vast archive of photographs, scientific facts, text, graphics and videos. Views of the Solar System offers enhanced exploration and educational enjoyment of the solar system and beyond. Virtual Solar System by National Geographic - your chance to discover the wonders of our solar system in a spectacular 3-D environment. Take a fly-by tour of the sun and each planet in its orbit, observe close-up views of the planets, extraterrestrial weather patterns, and more. What would you weigh on other planets? Enter your weight, select calculate and see what you would weigh on each of the other planets. See an Excel workbook that does the same thing. What would I weigh on...? - an interactive workbook which uses hyperlinks and protected cells. Calculate your weight on another planet. Investigate the seasonal relationships between the length of the day and the inclination and relative positions of the sun and earth. Animation of Earth's yearly revolution around the sun - In order to illustrate how much sunlight different parts of Earth receive through the year, this model shows our planet much larger and closer to the sun than it actually is. Observe seasonal changes in the amount of sunlight reaching locations on Earth - This animation shows a satellite view of Earth every day for a year. Examine the sunlit side of the globe to recognize the continent of Australia and peninsulas and islands of Southeast Asia. Describe the position of the sun, earth, and moon during eclipses and different lunar phases. The Inconstant Moon - With Inconstant Moon as your nightly guide you can explore Earth's ever-changing companion, and discover some of its strange phenomena. Moon Phase Calendar - shows the moon phases for each day of the current month. Moon Phases Java Applet - Select "both" for the point of view and run the simulation to see the cause of moon phases. Stop the animation and use their chart to see the name of the moon phase. Virtual Reality Moon Phase Pictures - You can view the phase of the Moon for any date and time [1800-2199 A.D.]. Predict tidal conditions based upon the position of the earth, moon, and sun. The King of Tides - a WebQuest which asks students to collect data and support a conclusion regarding the moon's role in creating tides. What Causes Tides? - This explanation of giant tides in the Bay of Fundy also includes a great illustration of the various types of tides. Describe the relationship between the mass of an object and the its gravitational force. Construct a historical timeline that depicts man's changing perceptions and understanding of astronomy. Understand how telescopes and spectroscopy manipulate light to reveal information about the universe. Basics of Space Flight - This starts with the basics of the solar system and quickly moves on to physics. A recap feature is provided at the end of each section of this project. Research Tennessee's contribution to earth and space science.